Alberta “Peachie” Jacobs, 78, of Palmyra, Missouri, passed away Sunday, November 25, 2018 at Beth Haven Nursing Home in Hannibal, MO. Funeral Services will be at 11:00 AM Friday, November 30, 2018 at the Lewis Brothers Funeral Chapel in Palmyra. Father Mike Quinn and Father Basil Eruo will officiate. Burial will be at St. Joseph Cemetery in Palmyra. Visitation will be from 10:00 AM to 11:00 AM Friday, November 30, 2018 at Lewis Brothers Funeral Chapel. Peachie was born December 5, 1939, in Springfield, IL, to Leo and Pauline Harms Buckman. She was married to Jerry Jacobs on May 11, 1991 at St. Joseph's Catholic Church in Palmyra, MO. He survives. Other survivors include two daughters, Rhonda Kane (Robert) of Wildwood, MO and Karla Haydon of Wildwood, MO; one son, Randy Haydon of Palmyra, MO; three grandchildren, Melissa Poertner (Ryan), Ryan Kane, and Becky Kane, all of Wildwood, MO, four great grandchildren, Kaleb, Logan and Blake Poertner and Avery Emmons, and one brother, Paul Buckman (Claudia) of Hannibal, MO. She is also survived by one nephew, Brandon Buckman of Quincy, IL and one niece, Leigh Ann Bergman of Hannibal, MO and two great nephews. She was preceded in death by her mother and father, Leo and Pauline Buckman, her grandparents and one nephew. 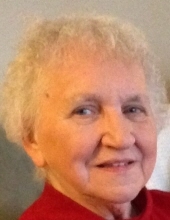 Before her illness, Peachie was an active member of the St. Joseph Catholic Church in Palmyra. She was retired from AT&T in Hannibal. She loved square dancing, sewing, and baking. She was known for her apple dumplings. She was also a wonderful seamstress. Memorial contributions may be made to Ronald McDonald House Charities of the St. Louis Area. To send flowers or a remembrance gift to the family of Alberta J. Jacobs, please visit our Tribute Store. "Email Address" would like to share the life celebration of Alberta J. Jacobs. Click on the "link" to go to share a favorite memory or leave a condolence message for the family.